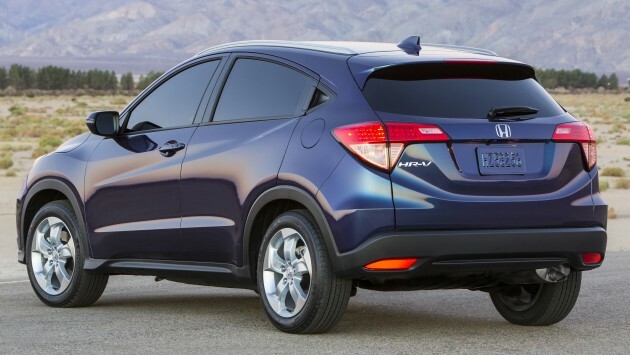 Earlier in the year, official pictures of the US-market Honda HR-V were released, but with little in the way of details. That changes now, as the Honda’s littlest SUV makes its proper Stateside debut at the ongoing Los Angeles Auto Show, along with full specifications of what Americans will get. The HR-V sits on the platform that underpins the B-segment City and Jazz duo, but its wheelbase is the longest in the family at 2,610 mm, 10 mm longer than the sedan and 80 mm longer than the hatch. Compared to the larger CR-V, the HR-V is 250 mm shorter at 4,295 mm, but its wheelbase measures just 10 mm less. We’ve seen the HR-V many times since its world premiere as the Vezel at last year’s Tokyo Motor Show, so there isn’t much new to be gleaned from the new US-spec car from looks alone (although it is interesting to note that Americans won’t receive the funky LED head- and tail lights that higher-spec HR-Vs get in ASEAN). It’s what’s under the bonnet that we’re interested in – as in Thailand, US-market HR-Vs come exclusively with a 1.8 litre SOHC i-VTEC four-pot, but the latter is also available with all-wheel drive. What’s more, front-wheel drive models can be specced with a six-speed manual, while the usual G-Design Shift CVT is available as an option (and standard on AWD variants). Available in LX, EX and EX-L trims, the HR-V comes as standard with cruise control, Bluetooth connectivity, Pandora radio and a reverse camera. 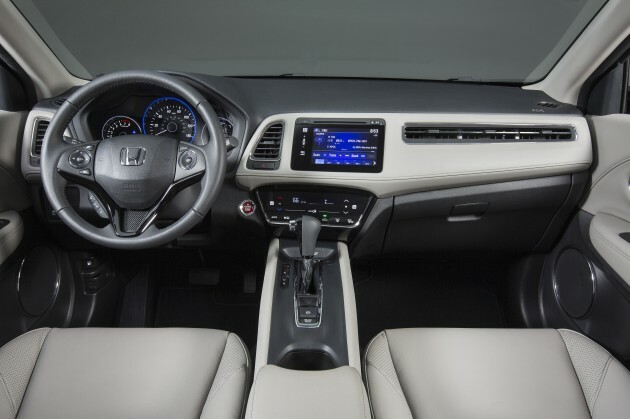 Choosing higher-end models will net you items like a seven-inch touchscreen infotainment system, Honda LaneWatch, keyless entry, push-button start, gearshift paddles, SiriusXM radio, heated seats, a sunroof, navigation and leather upholstery. In addition, all models get six airbags, Vehicle Stability Assist (VSA), traction control, Hill Start Assist (HSA) and a Tyre Pressure Monitoring System (TPMS). 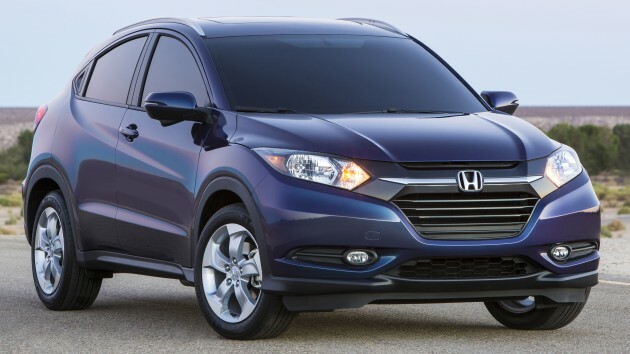 Honda expects the HR-V to receive a five-star rating from the National Highway Traffic Safety Administration (NHTSA) as well as the Top Safety Pick accolade from the Insurance Institute for Highway Safety (IIHS). With more and more countries receiving the Honda HR-V, it will surely be our turn to get it very soon. It’s gonna be a tough, hotly-contested marketplace when it enters our market, with the Peugeot 2008 and Ford EcoSport already here, and the newly-launched Mazda CX-3 set to arrive by the end of next year. It seems the CX3 has the upper hand in both aesthetic interior and exterior. The CX3 specs is also better as well and it is also available in diesel! Honda Malaysia take heed and do not price the HR-V as a premium SUV like what your Thai counterpart did. There has to be a clear gap of difference in price when comparing the HR-V to the CR-V. I for one do not mind the 1.5l engine since I’m not gonna rempit in it. Its just meant for fetching my family around, tq. sorry for saying this…but this looks like a ‘high’ car than a usual SUV. Shows your ignorance towards compact SUV. C-SUVs are supposed to look like raised cars rather than a full fledged maxi SUV, and most of their designs are carries over from their closest B/C segment sedan siblings. Hence, it is a HRV = High Riding Vehicle? so 1.5L, do i hear underpower? The interior is effing ugly. The passenger air cond vents looks so cheap…. Next Post: AD: Test drive any Volkswagen model today and stand a chance to win a Volkswagen Scirocco!